The ultimate experiment. A black boy and a white girl, raised equally as savages by a mute Nurse on a desolate island. Her only instruction is to keep them alive. 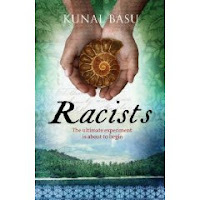 It is 1855, and expert British Craniologist Samuel Bates is debating with French scientist Jean-Louis Belavoix about racial superiority. The experiment, conducted just prior to the scientific revolution of evolutionary theory, is a battle of wills. Are the scientists interested in proof? Or merely interested in intellectual mockery of the other? Bates’ assistant, Nicholas Quartley, becomes much more emotionally involved with the subjects as he observes and takes his measurements. Kunal Basu is a wonderful storyteller. I was fortunate enough after reading The Miniaturist to see him read passages aloud at the Ubud Writer’s and Reader’s Festival in 2006. (I was also lucky enough to get a kiss on the cheek – but that’s another story!) Thus, when I read this, I imagined his baritone Oxford Professor voice, booming out this tale of racist justification and egotistical greed. The themes are well-handled. The voices of reason in the novel (mostly female) still possess that other kind of racism – the idea of the darker races as victims, who should be helped into ‘proper’ civilisation. I really don’t want to give too much of the story away. If you are interested in history and science, and enjoy adventure, then you will lap up this novel. Although, the story is pretty straightforward. For those who enjoy their novels with more layers, you may prefer the spicy sexuality of The Miniaturist or his novel I have not yet tasted, The Opium Clerk.